I remember the first time I laid eyes on Randy. I remember what he was wearing, where he was standing, the look on his face. Even more than remember what I saw, I remember what my heart felt at that moment. Somehow I knew this boy was different than any other boy I had ever met or would ever met. I remember the first time my eyes and my hands connected with each of our tiny babies as they took their first breaths and were placed on my chest. I remember the warmth of their bodies, the way the sound of my voice instantly soothed them, the way their head fit perfectly in the crevice of my neck and the way our hearts connected as we held on for dear life chest to chest with each other. Those precious moments in time are embedded in the making of my heart because during those seconds I willingly gave my heart away without question. I read somewhere that we don’t actually remember those impactful moments as detailed as we think we do. What I read said something along the lines of we usually recall them being “perfect” or remember them more fondly after time has passed because it isn’t until then we truly realize the impact that specific occasion had on us as people. I do understand that logic, and I would completely agree with that on probably 98% of life occurrences. But I whole heartedly believe that there are certain times when life hits you in the face instantly and you recognize immediately the gravity of the situation and you can’t help but be aware and conscious and mindful of every detail around you because you know your life will never look the same again. I think for me it happened with my husband and with my children because I gave a piece of me away without hesitation. A piece of me that I knew I never would get back or even wanted back. That moment has only happened one other time in my life that I can vividly recall. In April of 1998 I was 12 and my mom and dad loaded me up in a car to drive four hours north of our house to Lexington, VA. We were headed to visit some people they had met that had invited us to come watch a horse show and see what it was all about. I loved horses at the time and had just began to have interest in showing. So even though the trip was for my parents “to visit friends,” it was really to introduce me to this world of the American Quarter Horse Association to see if how it compared to the small open shows and Palomino shows we had been attending. I don’t remember the drive up, but I remember pulling into the show grounds. It was huge in my eyes. There were dogs running around everywhere, stalls decorated (with what I called curtains) that showcased the barn name and all the ribbons that had been accumulated, the smell of horses hit you square between the eyes, but how could it not… they were everywhere, as far as the eye could see. In my naive little mind, this was heaven on earth. And there she was… a beautiful bay mare unlike any horse I had ever seen before. I was mesmerized by her. I sat and watched Patty Campbell and Lou ride her for the better part of an hour. And then it happened. I met her… face to face… eye to eye. I remember the look in her eye. I remember her nose and her funny bottom lip. I remember the way my heart felt giddy being close to her. I remember touching her and being amazed at how soft and muscular she was. I had been around horses my whole life. It wasn’t that she was any different… but at the same time, everything about her was different. When I look back on this memory, I try to reflect on that information I read about not actually remembering the moment as it happened. I think how true it could be because at 12 years old can you really be aware of a moment that changes your life? I know for a fact though that I remember the sequence of events as it happened that day. I know what I saw and I know what my heart felt. At 12, I couldn’t comprehend or even predict the future that would take place so I was completely incapable of giving my heart away. She gave her heart to me that day. I knew she was meant to be mine and I knew that we would eternally be best friends. I knew all of this at 12 because my soul knew without my brain having to. Fast forward eight months and Christmas delivered the greatest treasure I had ever held and that was the start of a love story that lasted over half of my life. At 33 years old now, looking back, I can realize that the moment I shared with her the day we met held the same value in my heart and soul as the moment I met my husband and my children. The way I see it, when you give part of your heart to someone (or something) you are giving away the most fragile part of your being. You are giving them a direct connection to your soul, to your spirit, to your mind, to your inner most makeup. You are giving them a direct path to yourself; an open invitation to leave an impact on your life and your story. This isn’t always a two way path. Sometimes it is one person being vulnerable and the other keeping up a wall of protection. But when it is a two way street, when both hearts are exchanged willingly and openly, thats when I believe souls truly connect. Thats when I believe you are of one with the other. Dawn became a staple of my teenage years. She was a foundation for me, a safe haven, a protector. She taught me so much about myself during that time. Her and I grew up together, side by side in the barn, in the practice pin, and the show ring. 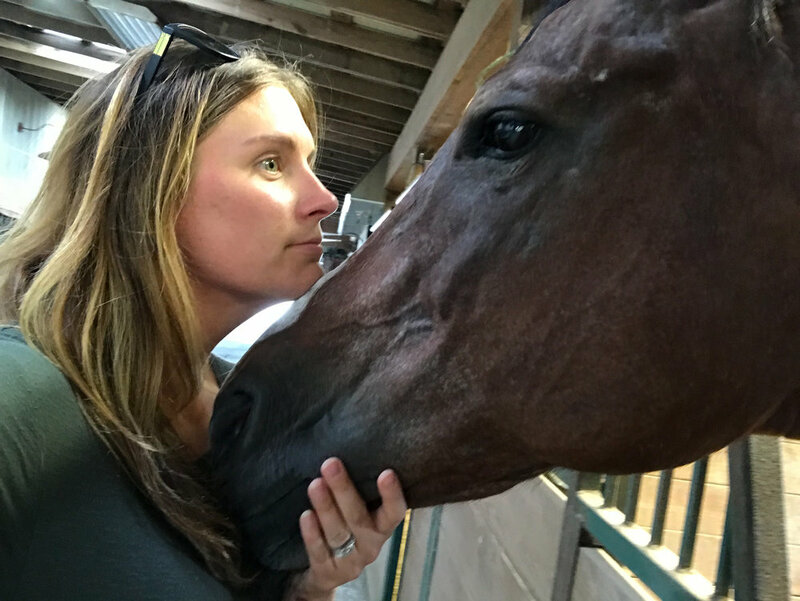 Other horses came in to my life, and there were plenty of times it was suggested to me that we should sell Dawn and find a “better” or “more competitive” all around horse, but those words fell on deaf ears. With her, for some reason in my heart, it was never about winning, it was just about doing it together. Those years of 12-19 revolved around showing. I was homeschooled most of high school so that I could travel and show. I did a “zero period” every day so that I could start school at 6am and be finished by noon so I could make the hour drive to where my horse trainer lived and practice with Dawn every afternoon. I didn’t do “high school.” No basketball games, no football games, no parties. I did horse shows and I have never once regretted that decision. Dawn and I were great team looking back at our show record. We were top 10 at the Youth World, Open World and the Congress multiple years in the showmanship, horsemanship and trail. We finished in the top five in year end points one year after traveling 42 weekends to shows. We had countless all arounds from weekend horse shows and more ribbons, medallions and trophies than I knew what to do with. One of my proudest moments in my horse show life was when her and I finished third in the 15-18 Trail in 2003. I screamed so loud when they called my number over the loud speakers to return to the arena for awards. I literally ran into the pin dancing when they called us out as third place. It was and still is at the top of my list of favorite horse show memories. That same year was our best year at the Congress. Together, as a team, we placed in every class we walked in. And it meant more than any other award I had or would ever receive because we, together, worked tirelessly for it. My horse show years with her are beautiful memories that I will cherish always, but the years that followed her retirement are the true gems of mine and her life together. These last ten years are the hardest for me to write about though. The years of watching her be a horse. Of watching her grow old. Of watching her love me so much that she had no choice but to love the ones I loved. So when Sullivan was born, introducing her to Dawn was important to me, but I NEVER expected for another chapter of a beautiful love story to unfold. I promised myself when Sullivan was born that I would never force horses on her. I always wanted it to be her idea so my goal was to only take her when she asked. We went some when she was an infant, (until Dawn sneezed in her face and Sullie wouldn’t go inside the barn for about 10 months after) but somewhere around 15-18 months old she started asking for Dawn and asking for the barn and so our visits became more frequent and I watched the love of my daughter and my horse turn into its own magical fairytale. You see, that whole giving your heart away and connecting souls, I think I learned it transcends generations. Follow me with this: Dawn and I were one. I carried a piece of her and she carried a piece of me. And then here is this beautiful child who carries a piece of her momma and I piece of her. Dawn knew Sullivan was a part of me, and Sullivan sensed Dawn was a part of me, and wha-la, their souls connected because of it. OKAY… so maybe that is far fetched, but that is my gut belief. Dawn was a different horse when Sullivan was around. She was calm, patient, kind, loving, and still. Sullivan would brush her tail for hours, walk under her belly, sit on the ground in her stall right next to her and that mare wouldn’t move. She let that child pull her around, ride her without being lounged, crawl all over her, poke her in the eye and pull her hair and she would stand there and just let it be. She was an angel of a horse. Dawn loved that little girl so much because she loved me and she knew that little girl was my world. I knew she was leaving me. That whole “fact” thing I read, completely contradicts that statement and I am sure one could give examples of why it isn’t true, but, I knew. My heart knew. My soul knew. The week before Christmas I stopped in the barn for a quick minute and gave her a kiss and rushed back out. I looked at her that day and thought briefly to myself “you are growing old sweet girl.” I couldn’t accept though, so I thought if I ignored it and rushed out of the barn instead of staring at her, it would be okay. On December 23rd over Christmas dinner at my moms I stared at a picture of Dawn and Sullivan and my heart twisted. I felt an emotion I didn’t know how to process or accept. Something in me knew she was leaving. I can’t explain it other than it being our connected souls. My soul felt the time was there. My phone rang on Christmas Eve and when I looked down at the name I knew that this precious mare, this beautiful gift, was leaving me. The ride to the barn was excruciating. Dawn is burned into my being. It isn’t like a dog. Dogs love you unconditionally no matter what. With her, it was more. We conversed in our own way. We argued. We apologized (mostly me because Dawn was always right.) I knew what her eyes were saying, if her ears were turned a certain way I knew what that I meant. I memorized the view from sitting in the saddle looking down on her neck, the curve of her top line, the twist of her hip, the sound of her feet hitting the ground, the swish of her tail every time my feet touched her side. I knew her bunny lip and completely related to the anxiety and stress she felt in certain situations. I knew her like you know the back of your hand or the words to your favorite song. She was my favorite animal, my favorite friend, my favorite being. She was my heart and soul in every essence of the phrase. Her name on her registration papers was ‘These Eyes Adore You’ and I always thought it fit her perfectly. I selfishly loved it because I thought it was the perfect description of how I felt for her. As I looked into her big eyes on Christmas Eve, I knew it was time. It is the most gut wrenching, confusing, hurting, sickening, heartbreaking decision one will ever make in this life time when you make the decision to let the companion you love so dearly leave this world. She had given me every ounce of her and I knew, by the look in her eyes, she didn’t want to live a single minute on this earth in pain and the least I could give her back was to not allow that to happen. Oh my, to sit and reflect on that statement makes it feel so true. Dawn carried me through so much. She was such a staple of joy in my life through the lowest of times and the happiest of times. She knew me better than I knew myself. My soul has been at such peace over the last nine months. Peace with my family, my children, my life. Acceptance of circumstances and willing to realize that accepting and approving are two totally different things. Learning to walk forward confidently and proudly and being whole with everything God has given to me. Because these were the feelings of my soul, I know she felt them too and it made it easier for her to say goodbye. For the first time in my relationship with her, she looked into my eyes and saw a heart that wasn’t hurting or in need of something more. It was full enough that memories of her alone would be sufficient to carry me through the rest of my days. I am so grateful that God blessed me with such a beautiful soul that taught me more about the depths of life, love, loyalty, faithfulness and friendship than I could ever begin to imagine. I’m so so honored that she chose me to give her heart to. I will forever miss that precious horse. My Dawn. My Delta Dawn.